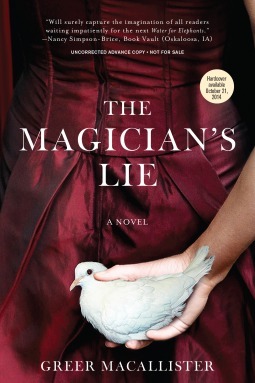 today I’m waiting on THE MAGICIAN’S LIE by Greer Macallister (expected publication: 13th January 2015 by Sourcebooks Landmark). It’s a Historical Fantasy novel which sounds really intriguing! Water for Elephants meets The Night Circus in The Magician’s Lie, a debut novel in which the country’s most notorious female illusionist stands accused of her husband’s murder –and she has only one night to convince a small-town policeman of her innocence. This entry was posted in Waiting On Wednesday and tagged 2015 debut, EM Castellan, Greer Macallister, historical novel, The Magician's Lie, Waiting On Wednesday. Oh! This is going on my TBR now!